According to a recent market research report published by Transparency Market Research, the capacity of the global geothermal heat pumps market is set to grow at a CAGR of 12.80% during the period from 2014 to 2020. The report, titled “Geothermal Heat Pumps Market - Global Industry Analysis, Size, Share, Growth, Trends, and Forecast 2014 - 2020”, sheds light on the market drivers, restraints, opportunities, and threats, among other key factors influencing the growth trajectory of the market. According to the research report, the global geothermal heat pumps market was valued at US$55.3 bn in 2014 and is expected to reach US$130.5 bn by 2020. 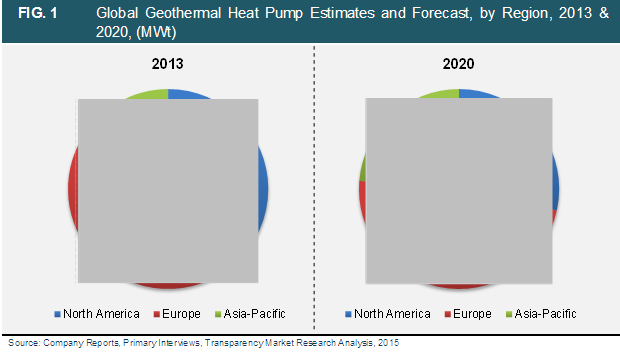 The installed capacity in the global geothermal heat pumps market stood at 52,638.18 MWt in 2013 and is expected to be worth 119,303.66 MWt by the end of 2020. Growing oil prices and the subsequent rise in electricity and energy costs have created a dire need for energy substitutes. The cost-effectiveness and dependability of alternative energy sources are making them popular in recent times. Owing to these reasons, the global market for geothermal heat pumps has been witnessing remarkable growth. Analysts predict that the worsening issue of climate change will continue to propel the geothermal heat pumps market in the foreseeable future. The global geothermal heat pumps market is segmented on the basis of technology, end user, and geography. The technologies used in this market are open loop systems and closed loop systems. Closed loop systems are further segmented into horizontal loops, vertical loops, and pond or lake systems. The end users of the geothermal heat pumps are residential and commercial. Both of these segments are further sub-segmented into new building systems and retrofit systems. Geographically, this market is classified into regions such as Asia Pacific, Europe, and North America. In terms of technology, the closed loop systems market held the biggest market share in 2013, accounting for nearly 85.68% share in the global market. Their convenient loop configuration makes them a popular choice amongst several end users. The research report indicates that Europe and North America held the leading positions in the global geothermal heat pumps market in 2014. However, expert research analysts predict the Asia Pacific market will exhibit a steady growth rate in the near future, with huge demand expected from China. Some of the important companies profiled in this market research report are GeoMaster LLC, WaterFurnace International, Florida Heat Pump Manufacturing, Bryant Heating and Cooling Systems, Dimplex, Danfoss Heat Pumps U.K., Enertech Global LLC, and Climatemaster. To give a clear picture of the competitive landscape, the report gives insightful information about their financial status, business and marketing strategies, product portfolio, research and development plans, and recent developments.